Yokosuka MXY-7 Ohka (Cherry Blossom) suicide rocket pilots of the Imperial Japanese Navy's Jinrai Butai ("Thunder Gods" Corps) of the 721st Kokutai ("Air Wing"). 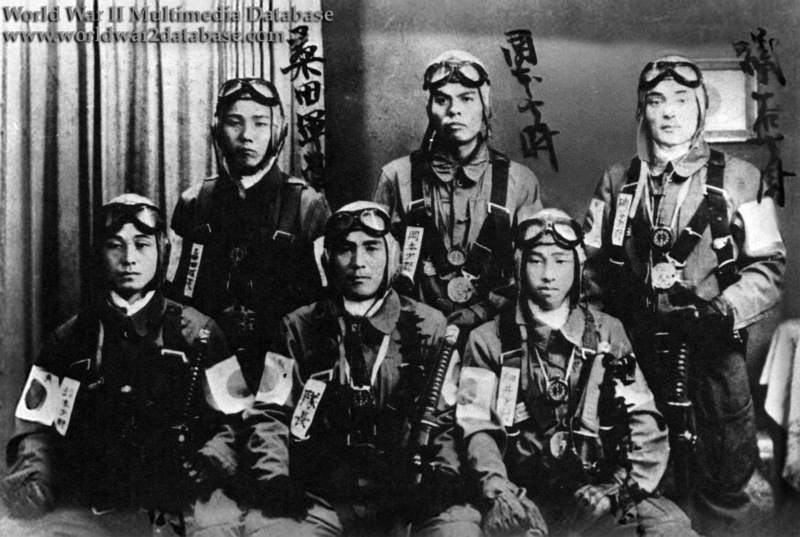 Standing left to right: Petty Officer Kuwata, Reserve Sub Lieutenant Kanae Okamoto (who may have been the senior officer of three surviving pilots of the "Thunder Gods" Corps on Kikagashima at the end of the war); Sub Lieutenant Isogai; Sitting left to right: Sub Lieutenant (illegible)-moto; Squad Leader Mori-(illegible); and Sub Lieutenant Hosai. The Ohka, developed in 1944, was a manned cruise missile that was carried underneath a modified Mitsubishi G4M "Betty" torpedo bomber, Yokosuka P1Y Ginga "Frances" bomber. While the 721st combined squadrons of Ohkas, G4Ms, and A6M Zero-Sen Fighters, the lack of pilot training and experience meant that the unit suffered from poor tactical coordination. The G4Ms were easy prey for the American Grumman F6F Hellcat fighters, and in the debut attack against the American Fleet off Okinawa on March 21, 1945, sixteen G4Ms are shot down along with their Ohkas. Only four or five Allied ships are known to have been struck by Ohkas during the war. The image appeared in Parade Magazine in October 1945, when the American public first began to receive details about the suicide rocket program.